James R. Kennedy and Dave Bradshaw are our commentary duo for tonight. While nobody looked bad at all in this match, War Machine were just a cut above. 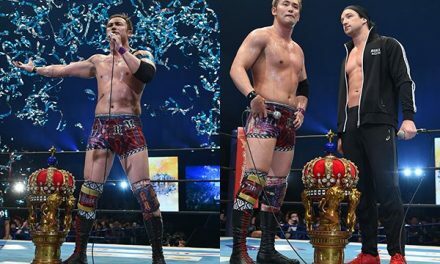 They just exuded star power, and somewhat overshadowed the feud they were trying to build (Scurll against Hendry) just by being so awesome. Over the past few years they’ve become the bar for heavyweight tag teams, with both of them being experts in how to utilise their size and power to the utmost in their matches. After the match the Prestige went on to attack Scurll three on one (War Machine just seemed to disappear) to further build to the eventual Scurll-Hendry match. Joe Coffey came out next. He was originally scheduled to be facing Michael Elgin in the third round, but Elgin had to pull out due to contractual reasons. He got on the mic, ran though a fairly generic heel promo and then demanded that his hand be raised by a ref to mark his progression to the quarter finals. This never happened, as GM Adam Blampied came out to announce that there were no byes in the World Cup and that Coffey would be facing somebody who was making his return to WCPW: former champion Joseph Conners. This was notable as this was the first time that a guy under a WWE:UK contract has been able to work WCPW. It’s probably far more of a sign of how little WWE values Conners than some sort of a positive releationship between the two companies though. While Conners got a huge reaction for the suprise factor, I less than enthused. Joseph Conners is not a good wrestler, and he proved it here with an utterly boring match with Coffey. He’s so bad at the little things. While he’s not a bad bumper, he never conveys any long term impact of moves. One moment in this match that really irked me was Conners just standing up straight after taking a top rope crossbody from Coffey, who by no means is a small man. This wasn’t a fighting spirit no-sell, this was just Conners being a bad wrestler and forgetting to sell. I feel like I’m saying this for every other match, but this was another one that would have really benefited from clocking in around the fifteen minute mark as opposed to the twenty plus minutes it ended up going. It wasn’t nearly as egregious as the Ricochet-Angelico match, as overall they did a solid job of building through the entire match and peaking wonderfully towards the end, the only problem was it took a long time to build and lost the crowd somewhat midway through. This isn’t really an uncommon problem with Lethal matches: they take a logical route to get where they’re going and once they’re there it’s great, but they take a long damn time to get there. Going in I was somewhat skeptical of how well this match could deliver, especially in the main event spot. I expected it to be somewhat of a spectacle, but as with all Mysterio matches in 2017 to be somewhat limited. I was wrong. This was head and shoulders above every other Rey Mysterio match of recent vintage, and the exact right choice for the main event spot; it was the best match on the show. I’m not going to say this looked like prime Mysterio, that would be senseless hyperbole, but at the same time it wasn’t a million miles away. This was easily the best I’ve seen Rey move around this year, a far cry from some of the less mobile and somewhat painful to watch performances that he’s turned out in recent times. He was seamlessly flowing through all his signature stuff when on other occasions going through the motions has come across laboured. I think a lot of credit for this has to go to Ospreay too. I think a real underrated aspect of his game is just how great a base he is for other flyers; it’s something that is lost due to just how great a flyer he is himself. It’s no coincidence though that aerialist after aerialist has their best match with him. From Sydal, to Andrews, to Flash Morgan Webster and now this era of Rey Mysterio. While it may be an undervalued asset, it has lead to so many great matches now. It’s not just good due to Mysterio surprising you with a return to grace, it’s also really smartly built. They build the whole match around the 619, with Mysterio getting progressively closer to hitting it each time he goes for it, which in turn lead to increasing reactions every time Ospreay found himself draped on the ropes. Given this though, they also did a great job of making the transitions to set up the 619 not look clunky as they can so often. Ospreay even found himself with an opportunity to go for the move himself at one point. Overall the Round of 16 in the Pro Wrestling World Cup was a strong show, that was one outstanding match away from being great. The standard across the board was pretty high, with a slight dip in the middle made up for by a strong start and finish. 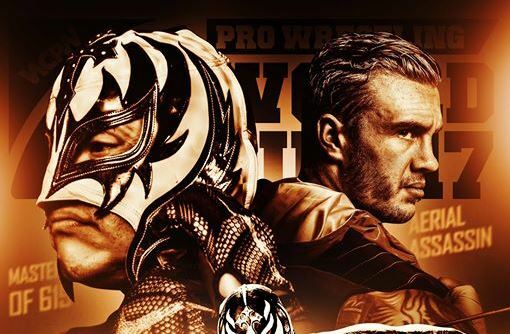 If you could go back and cut down the Lethal-Sabre match and the Angelico-Ricochet match you’d have an absolute belter on your hands capped off by the magnificent spectacle of Ospreay and Mysterio.